NOTE: This article by MassResistance researcher Amy Contrada originally appeared in American Thinker on 7/20/18. 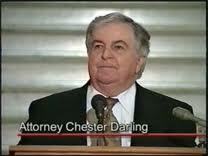 Boston attorney Chester Darling became a local legend when he won the 9-0 decision on the South Boston Parade case before the US Supreme Court. He later worked with Parents' Rights Coalition (now MassResistance) on parents' rights issues. In 2015 the Boston Pride contingent marched in the parade and made sure everybody saw their rainbows. OUTVETS marching in the parade. For years Mayor Marty Walsh, along with all the other "progressive" politicians, refused to march in the parade. But he gladly marched after he forced the parade to be "LGBT inclusive." [VIDEO: Besides the Catholic Action League of Massachusetts, the only other Catholic group to publicly object was the Immaculate Heart of Mary School in Still River, MA, which had run the famous St. Patrick float (above). In 2015 they pulled out of the parade rather than compromise their faith. The nuns composed this song, "The Leaving of Boston."